Meet Dante, Malice, and Elliot, three adventurous folk with chips on their shoulders and prices on their heads. These outlaws are wanted dead and alive, so you can imagine their lives are a bit complex at the moment. You'll control these three "heroes" in Grave Danger, each of whom has unique abilities used to traverse and manipulate the world. Dante can wall climb and fire a pistol, for example, while Elliot double jumps and blasts wizard shots and Malice tosses a scythe and floats in mid-air. 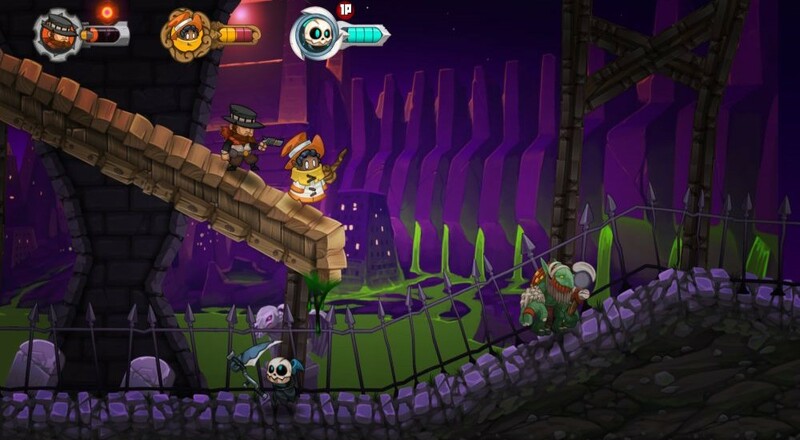 Use their skills to solve puzzles in each stage so everyone can reach the exit safe and sound. What makes Grave Danger so interesting is its presentation. This isn't just a character switching puzzle platformer with local co-op, it's a sarcastic and occasionally badass tribute to multiplayer strategy and entertainment. The game is currently out for PC and plans are in place for Xbox One and PS4 versions sometime this year. Wii U and Nintendo Switch releases are also under consideration, as is a DLC pack with new characters and levels. Page created in 1.5986 seconds.